not much time to post today, but wanted to let you see this quilt too. It actually hasn’t come home to me from Fons and Porter yet but I wanted to show you anyway…this one is from Laura Gunn‘s premiere line Lantern Bloom from Michael Miller. 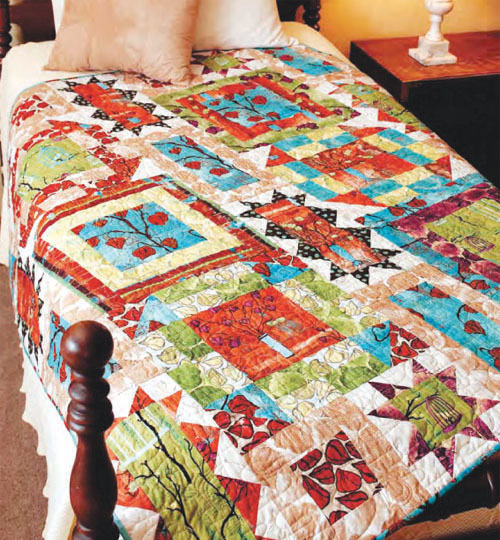 Click on the picture to link to the free downloadable pattern for my Lantern Bloom quilt that I call Lantern Lounge. Simple, traditional and modern at the same time. Make one up in Lantern Bloom, or your own fabrics, then send me a picture or download it onto the Blue Nickel Studios flickr page. I wish I could stay longer, but I really have to get back to the studio. I’ll be back….soon as I can! Oh, and you can read a bit of my “history” at Quiltmaker’s Blog Quilty Pleasures, here. Ciao, all!! Awesome, Scott. This is just gorgeous. And if you don’t make a full quilt out of my next line you are in big big trouble!! How beautiful! This is definitely one of my all time favorites! I think I need to make sure I get a lot of rest before a photo shoot and have Linda take LOTS of shots to find a good one…this session only involved about 20….127 might work next time!! And I just bought some of this fabric to use in a quilt of my own design, but yours is just too, too clever! Love it! Just finishing up this quilt kit I got from Fons and Porter. It is a beautiful design Scott and I have enjoyed making it. Can’t wait to show it off! Cool!! Hopefully you can post it to the Blue Nickel Flickr Group or send it to me to share with everyone!! Can’t wait to see it! !